The 5th Cairo Video Festival, organised and hosted by Medrar - an eight year-old platform for contemporary artists - brings video art and experimental films by Egyptian and international artists and filmmakers to the city for two weeks. The festival, which this year features almost 200 video art and experimental film projects from more than 30 countries (six of which are Egyptian) and takes place at the Medrar headquarters in central Cairo, is an opportunity for local artists toying around with video art to showcase their work to the public, while exposing the Egyptian art scene and audience to new media artworks from across the globe. In keeping with its mission to become "a platform for all those experimenting with the mediums of film and video," the festival's diverse and extensive programme of screenings are speckled with parallel sessions, including a screening and talk by prominent contemporary visual artist Hala Elkoussy, and screenings of curated film programmes from Finland, Spain, and Canada. There is also a daily exhibition of loop videos from 4pm to 7pm. On the opening night, Wednesday 25 September, Medrar’s space was bursting at the seams with eager crowds. Watching films ranging from 2 to 25 minutes, hailing from Ecuador, Germany, Lebanon, Greece, Mexico, and more, the Cairo audience oscillated from giggling, applauding, and at times being transfixed in utter silence, across the two hours. As was proved by the first day’s programme, the event does not pretend to be Cannes or Venice film festivals: this is an experimental affair, presenting high concept, low budget videos from around the world. Since 2005, Medrar has hosted festivals and workshops, provided a collaborative space for a growing movement of media artists, and disseminated audio-visual material documenting the local contemporary art scene, through its three core projects: the video festival, Open Lab Egypt, Medrar TV. Medrar's pioneering project was this video fiesta. The festival was the brainchild of a generation of students and fresh graduates from the Academy of Arts, in contact with visual artist Shady El-Noshokaty. The artist, who established the organization ASCII for contemporary art education in 2010, pioneered a series of experimental media art workshops for Faculty of Arts students starting in 2010 that helped members of this younger generation to become more active in the new media arts scene, putting their education into practice. This younger generation of aspiring artists was at the time largely locked out of events held by the government (the Fine Arts sector) and more established independent arts spaces such as the Townhouse Gallery of Contemporary Art. In 2005, the Contemporary Image Collective (CIC), an independent space dedicated to the promotion of a new contemporary visual language, had just emerged on the scene, and members of this group of artists rushed to utilise the new platform for an event focused on the elusive genre of video art. The first edition of the video art festival thus materialised in 2005, with the exclusive participation of Egyptian artists. From the start, the festival also intended to bring together aspiring artists with those with previous experience with video art, as well as critics and a diverse audience, in order for a dialogue to be sparked, "all in the same hub." In the second edition of the festival, also held at the CIC, Arab video artists were invited to participate, expanding the geographical scope of the works exposed to Cairo's audience. The third time the festival was organised, however, was when it started to adopt a truly international character. An open call system was used and submissions were accepted from global artists and filmmakers. 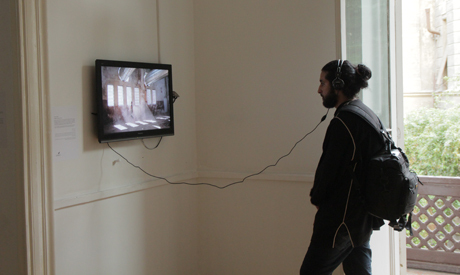 The previous episode of Cairo's video art festival, held this time at the Goethe Institute in 2010, was the biggest yet. Institutions started to participate with curated programmes, emerging from Pakistan, the Netherlands, and Finland. This year, Medrar reclaimed full ownership of the festival. "It took a lot of effort to put it all together, from going through all the submissions, coordinating with the committee, building the programme," Medrar’s projects manager Dia Hamed tells Ahram Online. It was meant to be an annual festival, he explained, but obstacles perpetually materialised - the most evident of which was the country’s state of political turmoil in the aftermath of the January 25 Revolution. In three months, Medrar was able to construct an extensive programme with almost 200 films. The organisers selected a committee to sift through the submissions and cook up a diverse and varied line-up. The committee, which remains anonymous, is composed of experienced Egyptian artists, who have studied video art, and are open to concepts of experimentation and diversity. The idea was not to feature prominent video artists with proven track records in the field. "In the criteria, we do not rely at all on the artist's bio. It could be the artist's first work," says Hamed. "We look for quality, and depth, and a sophisticated treatment of the subject matter." "The festival is theme-less," says Hamed. The goal was to present varied forms of video art projects, pushing the boundaries of the art form’s characterisations. "Definitions of video art vary, but for me video art is a space that can handle the greatest degree of experimentation in the realm of moving pictures. It can be anything, from graphics, computer-based animation, to stop-motion, performers, dancers," says Hamed. "(With video art) experimentation is limitless, spontaneous, and unrestricted, and is not tied to dramatic structure." Evaluation of video art is therefore different. Rather than scrutinising acting or directing, Hamed says this art form is better judged by considering treatment and technique, or "how the artist employs all the elements of the production to relay an emotion or an idea, regardless of the techniques used." Despite a growing movement in the field of feature and short-films in Egypt, there is a notable dearth in artists working with video art. Hamed attributes this to a reluctance of some artists and filmmakers to experiment with the art form, but even more so to the lack of local support for video art projects, in terms of production or acquisitions by local museums. Perhaps the biggest impediment remains in the formal education Egyptian art students are receiving, which is still arguably very traditional. "There is no real scene for it within Egypt," he says. But this video art event could act as an instigator. "We try to use the festival as a tool to revitalise this movement of video art in Egypt." "We always try to reach out to different audiences, in hopes of inspiring them, to start experimenting or thinking about video art," Hamed says. "Some people attend the screenings then say, okay, now we've charged our energy, we can start working. But many artists are still stuck in their comfort zones." The festival runs until 7 October at Medrar. Read the full programme here.